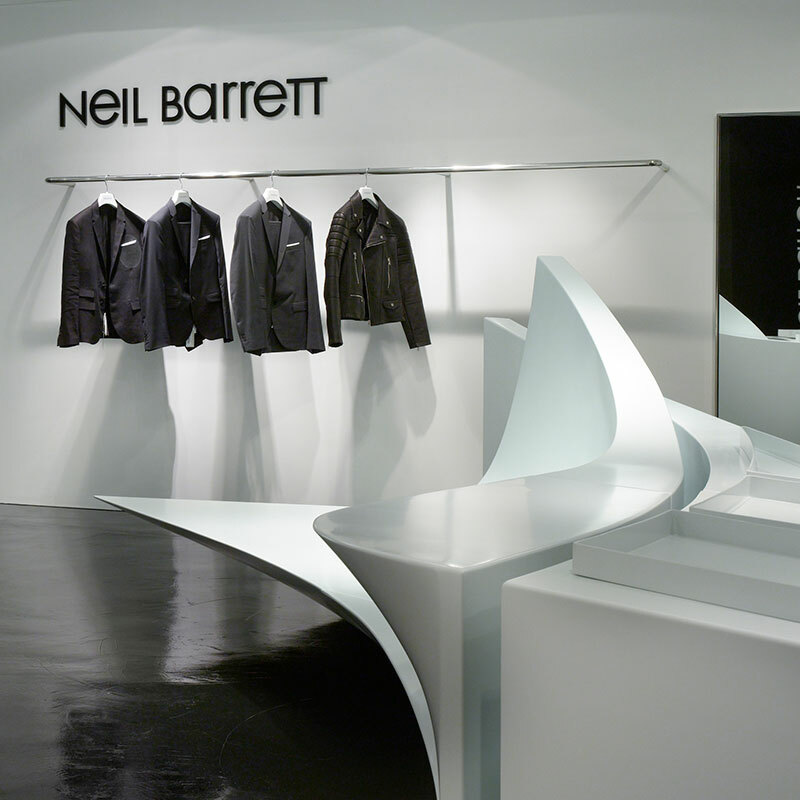 Zaha Hadid Architects designed 16 bespoke polyurethane display units for fashion designer Neil Barrett’s shops. Fashion designer Neil Barrett hired Zaha Hadid Architects to design a cohesive display concept for a new flagship store in Tokyo that could be easily rolled out to his other locations as well, which include four shops in Seoul and one in Hong Kong. The result had to be as sartorial as Barrett’s fashions, so Hadid’s team came up with the idea of cutting the displays for all of the stores from a single block of material. The concept resulted in 16 bespoke display elements, which all fit together like pieces of a puzzle. “We wanted to design a project that always belongs together but offers a choice between different sizes,” said project architect Claudia Wulf. “The reason we designed a modular landscape is that we have extremely different area requirements [across all of the shops].” The units, which are carved from a solid unit, range in size from 13 1/2 feet by 13 3/4 feet to 4 feet by 6 feet. 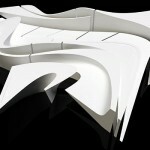 Paired, the units create a sinuous artificial landscape that unfolds across multiple display levels. The pieces can be grouped to suit the scale and space of each boutique, and display shoes, bags, or accessories just as easily. 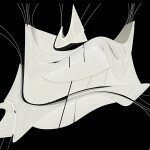 Hadid’s team worked with Rhino to develop the idea of creating tangents through straight lines and curves, as well as soft lines and strong edges. What begins as a sharp point curves softly into the next display shelf. The team bounced the evolving design between the client and Chinese fabricator Evergrow, refining the profiles of each unit. 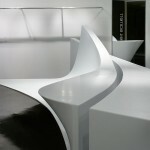 For the flagship store in Japan, the designers chose to craft the first set from Corian in order to develop a strong dialogue between the existing envelope of the building and the display’s smooth yet curvaceous surface. A uniform, white palette enhances the formality of the display, while creating a strong contrast against a polished black floor. For subsequent locations, Hadid’s team updated the display material to polyurethane, as there was less time afforded for transportation and installation. The 3D file was sent to Evergrow, which CNC-milled the pieces from solid polyurethane. The fabricator applied a very thin coat of glass fiber resin to reinforce the surface and sanded it until smooth. A high-quality lacquer, comparable to what would be used for an automotive finish, was applied to protect against daily wear and scratching. 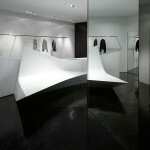 Zaha Hadid Architects is currently developing Neil Barrett Shop in Shop projects in Beijing, Shanghai, and Seoul. As many as eight shops could be completed by the end of 2013.